Knitting 24/7: 30 Projects to Knit, Wear, and Enjoy, On the Go and Around the Clock by Veronik Avery, STC Craft/A Melanie Falick Book, 2010, 128 pp. I always look forward to seeing new patterns from Veronik Avery. I know they’re going to be well written, with attention to fine details, and will result in lovely projects. Knitting 24/7 doesn’t disappoint on that count. The spectrum of projects is a bit different than her other book — the focus is on easily portable as opposed to more involved projects. Thus, though there is a skirt, a gorgeous elegant sweater, a vest, a shrug, and a very pretty lace tank, the rest of the patterns are smaller items. The book is divided into 3 sections: a.m., p.m. and weekend, with a sweet little “sneak in a few rows” checklist preceding each chapter (before breakfast; waiting for the water to boil; etc). I’m not sure if I really felt any theme uniting the patterns within each section, but that could just be me. Techniques range from beginner to advanced intermediate levels, including lace, cabling, and colorwork. However, since the stated goal of the book was to provide projects that can be worked on the go, the applications of these techniques are straightforward. Pattern repeats are easily memorized; the colorwork is simple (still lovely!). The colorwork, cable and lace pattern repeats are charted only. Sizing varies depending on the pattern. The skirt is offered in XS-3X; the sweater, vest and tank are XS-2X. Socks are one size, as are several of the mittens and the beret. The photography is lovely and shows adequate detailing of the projects. Schematics are given for the skirt, sweater, tank, vest and shrug. 30 patterns are included (note that Ravelry lists 29, but grouped the cowl & fingerless mitts together). My personal favorites are the Fleur de Lys Hat (a sweet stranded bucket hat of sorts), the Modern Pillow (straightforward but elegant), and the Elemental Pullover. 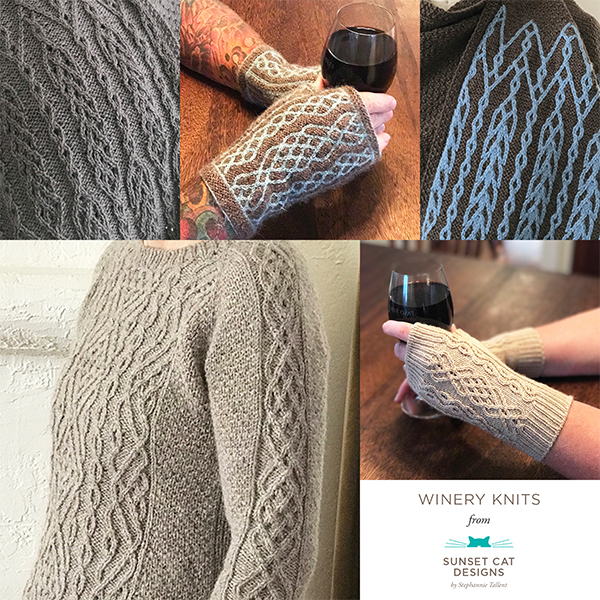 The first two would make great gifts for people who will treasure your knitting. The latter I would quite selfishly keep for myself. You can purchase your copy through Amazon by clicking on the book cover above. I received my review copy from the publisher. Next post: It’s the Weekend? !